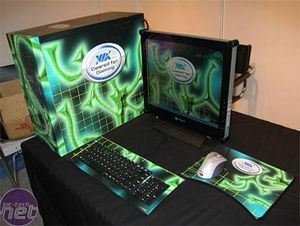 VIA Technologies have long been known as stalwarts of the PC industry. From their enthusiast grade KT133 chipset through to their current K8T800 Pro Athlon 64 product, they have always been at the forefront of providing you guys with cool technology to play with. When VIA approached us to enquire about having a custom modbox made to showcase the gaming performance of the K8T800 Pro chipset, we were delighted to oblige. VIA gave us a budget and a timescale, and we delivered a custom bit-tech box to them in time for their appearance at the ECTS trade show this year. As some of you will know, we are no strangers to custom boxes commissioned for companies - our Project 3GClear box for Intel was a great success, as were the Take 2 Vietcong cases, and we hoped we could follow up those with another cool rig for VIA. Then we hit a problem. Our resident modding guru Macroman was away on holiday for the two weeks we had available for the build. Orac3 mod-God G-gnome was too busy with his next project (shhhhh!) (nevermind that he lives in Australia! -Ed) to take the time out to work on this. There was no way we'd be able to get components out, and the case back, to Chris "Cinemedia PC" Newman in the States in the time we had. This required drastic action. Follow us over the next pages as we give you an overview of the build.